Sporopodium xantholeucum, photographed by André Aptroot. The Ectolechiaceae are a mostly tropical family of lichens containing green algae. Characters (from Cannon & Kirk 2007): Thallus usually foliose or crustose. Ascomata apothecial, pale, convex, without a well-developed margin. Interascal tissue of very narrow anastomosing pseudoparaphysis-like hyphae, variously pigmented, the apices thin-walled. Asci with a J+ apical cap and a very well-developed ocular chamber, with an outer J+ gelatinous layer, mostly 1- or 2-spored. 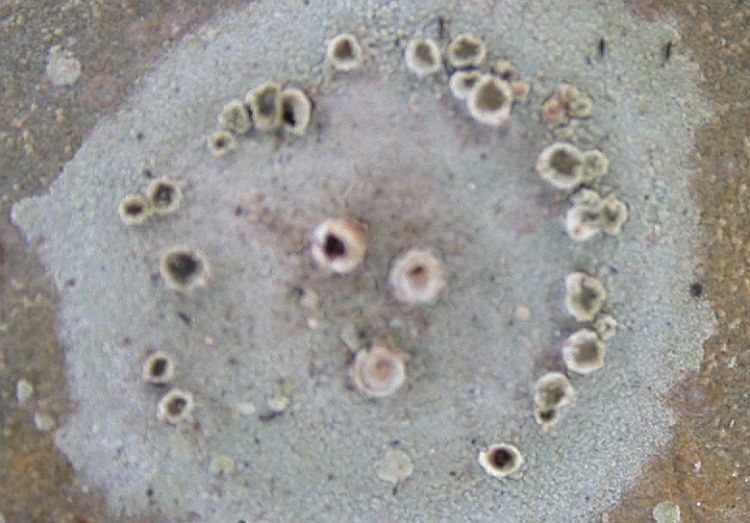 Ascospores muriform, usually thin-walled. Sometimes with cephalodia. Anamorphs pycnidial, often with campylidia.